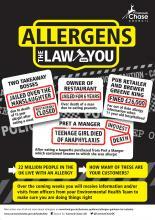 Cannock Chase Council has launched an awareness campaign relating to food allergens for businesses in the District. To help promote the campaign, earlier this year Cannock Chase Council’s Food and Safety team issued a ‘Shock Tactics’ leaflet to food businesses in Cannock Chase. The ‘Shock Tactics’ reminded businesses of high profile cases in the UK, where members of the public have died after eating food purchased from commercial food businesses. Business owners were reminded of the possible consequences if things go wrong, these can include heavy fines and even jail sentences. Councillor Christine Martin, Portfolio Leader for Health and Wellbeing said “Our food businesses are responsible for identifying and managing allergens in order to produce safe food for all of their customers. “We want to emphasise the seriousness of getting it wrong and the possible impact on the consumer, the food business and the individual food operators. Food businesses must be able to provide allergen information to the consumer for both pre-packed and non-prepacked food and drink. The business will need to identify any of the 14 allergens that may be present in any of their ingredients and finished products and must prevent cross contamination of foods which are claimed to be ‘free from’, particular allergens. As part of this campaign the Food and Safety team will be contacting food businesses to establish what controls they have in place to identify and manage allergens. Watch the video 'A Day in the Life of Chloe' - Chloe Fitzpatrick is an inspirational, determined and positive minded teenager, who does not allow her severe allergy to control her life.